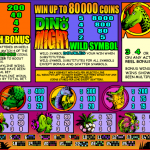 Dino Might is a Microgaming slot which takes you back in time at an age when the almighty dinosaurs ruled the earth. The slot has a vintage look which perfectly fits the theme and corresponding background sounds. The symbols in the game are well designed, but modern animations are absent since this is an older slot. 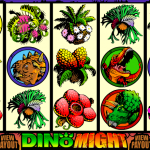 What the game lacks in visual effects it makes up in bonus features, which is one of the main reasons why Dino Might is still a popular slot across Microgaming casinos even today. The wild symbol in Dino Might will substitute for all of the game symbols except the scatter and the bonus symbols. He will also double any payout he substitutes in. If you manage to land 3, 4 or 5 scatter symbols, which is the Amber Fossil symbol, you will trigger the Match Bonus game. In this game you will need to choose among 21 blocks, each one hiding a dinosaur or a x2 multiplier. Once you match four dinosaur symbols the feature ends. The maximum payout in this bonus game is set at 20.000 coins. If you land 3, 4 or 5 Triggersaurus symbols on a winning pay line the Reel Bonus will be triggered. You choose among different symbols and each one will award a coin prize. You get as many picks as the number of bonus symbols which triggered the bonus game. Players can win up to 4.500 coins in this feature. 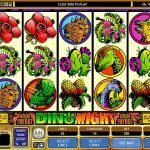 Dino Might is an interesting slot, despite its age and low visual effects. The wild symbol doubles a payout which comes in handy during base play, keeping your balance from sinking too fast. The bonus features are attractive, despite the lack of a free spins bonus. The top prize of 20.000 coins is certainly attractive enough to give Dino Might a try for real play. If you think playing a game based on an imaginary city called Cashville might be profitable… you should consider playing Cashville a 5 reel slot by MicroGaming.